The Skull Ranger is a rare female skin outfit for the game Fortnite Battle Royale. Skull Ranger was released in preparation for the 2018 Halloween and features some unlockable designs. 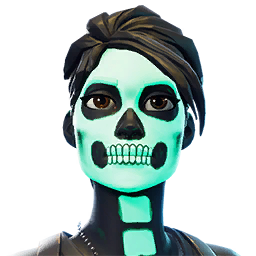 Skull Ranger is the female counterpart of the Skull Trooper outfit. 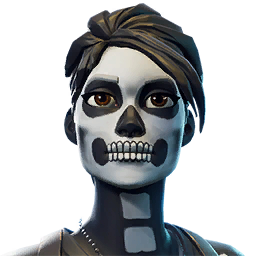 It is worth noting that Skull Ranger does not unlock the Skull Trooper Challenges. The Skull Ranger features a soldier dress in a skeleton costume. The costume also comes with painted skin with a skull face paint. The Skull Ranger outfit also features unlockable designs that alter the color of the skeleton bones. This outfit was designed for the Halloween holidays. This rare costume is a part of the Skull Squad Set that is meant for the Halloween season of the game. This outfit can be purchased in the Cash Shop during its rotation. This outfit is likely only available in rotation during the Halloween seasons. Skull Ranger high-quality PNG images with transparent background to use them as you wish (YouTube thumbnails, skin concept and so on). Skull Ranger rotation history in the Fortnite Shop. Below you can see the first and last time when Skull Ranger could be bought from Item Shop, also how many days it was seen and the dates list. This cosmetic item can be re-added in the future, so check the store regularly. Looks great but it was only out for 14 hours, which is sad but I am getting the Skull trooper instead. But remember Skull Trooper isn’t rare anymore so rip. Does anyone know when this skin will come back out?